One of the best painters of all time, Caravaggio, is known for his works in a realistic Baroque style. Despite his reckless nature, he was an influential Italian artist of the 17th century, creating large-scale works on religious topics in Rome and Naples. At the end of the 16th century, Caravaggio moved to Rome, where he quickly found patrons, one of whom was Francesco del Monte, who helped to get the master of the first major project – decoration of the side walls of the chapel in San Luigi. The composition of this work included the Appeal of the Apostle Matthew, as well as the Inspiration and Martyrdom of St. Matthew. These works were successful, and the subsequent works contributed to the formation of the reputation of the master, making him one of the best creators of religious paintings in Rome, and also spawning a number of imitators and followers. Despite the unique style and realism in the works, some conservative clergymen considered a number of paintings vulgar, despite their demand. The ceiling of the chapel was painted by Giuseppe Cesari, however, due to his employment, he could not finish work on the whole church. Then Cardinal Del Monte interfered with the work of Caravaggio. “The Calling of Matthew” depicts the moment in which Jesus Christ inspires Matthew to follow the Lord and further becoming an apostle. This scene illustrates an excerpt from the Gospel of Matthew. After the call to “follow me,” Matthew fulfills the request. Christ points to Levi, the tax collector, who repeatedly appears in works for this church. Confused and uncertain Matthew, seeing Christ pointing at him, responds with a gesture, as if asking: “Me?”. The rays of light, illuminating the two young people, create a visual contrast between the reactions of these characters, showing extreme forms of possible behavior in the same situation. The dramatic nature of the scene is in the gripped moment, when the characters present are in shock, and Matthew himself is indecisive and in complete confusion, despite Christ experiencing monumental certainty. A simple aesthetics of the work the author borrows from his early genre painting, so the picture has much in common with the fortune-teller and the Schuler, in which events also occur in the tavern. 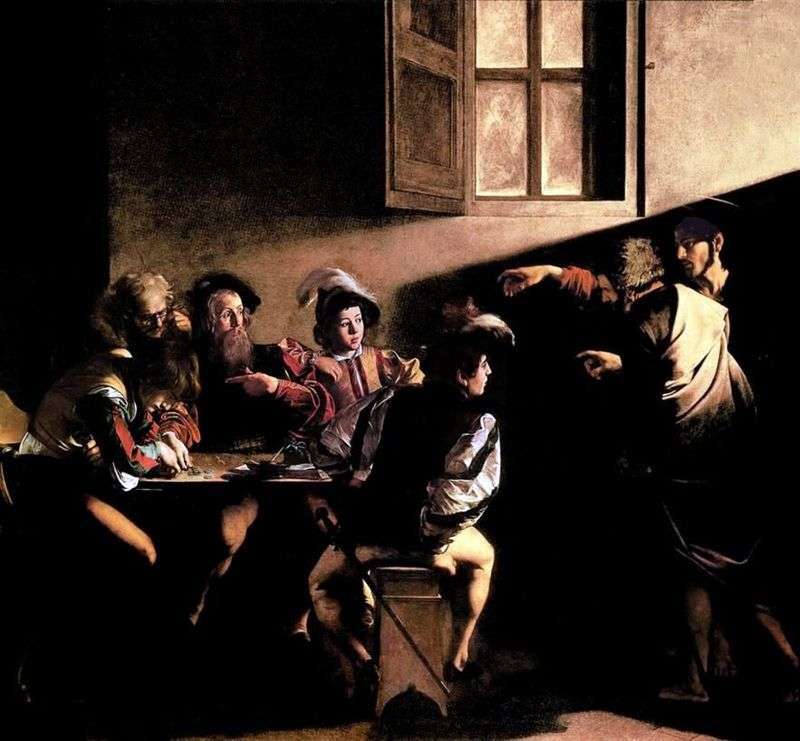 Description and meaning of the painting Appeal of the Apostle Matthew by Michelangelo Merisi and Caravaggio.